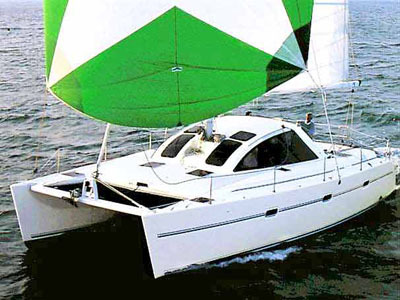 Impressive dimensions and harmonious proportions create a luxurious effect in this sailing catamaran. Hull number-one of Lagoon’s new 77-footer, the SEVENTY 7, dominated the Miami boat show this winter. She rested at the dock, pulsating, almost breathing, as fingers pointed and mouths gaped open. Between her size and stand-out features, she commanded attention and sprouted lines of spectators wanting to inspect this newcomer. A big beastie, she’ll be the coveted domain of a lucky few enjoying crewed luxury whether in private ownership or on charter. 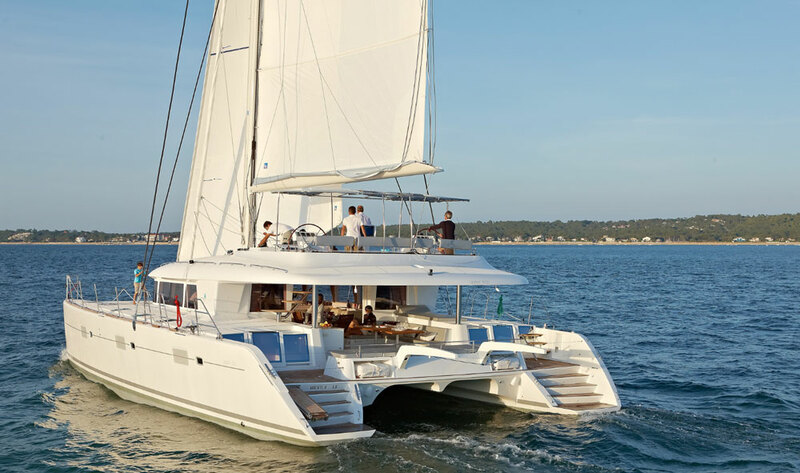 Step aboard, for a quick look at this new monster of a sailing catamaran. 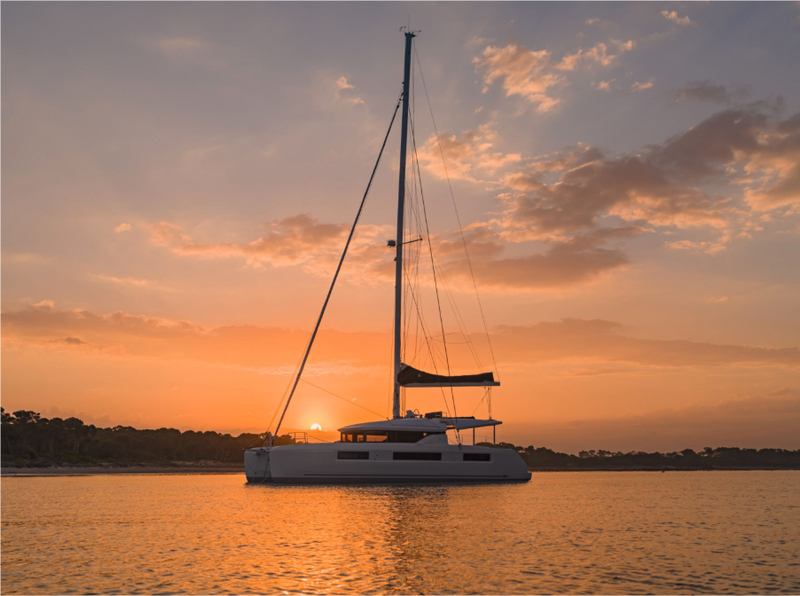 The product of naval architects Marc Van Peteghem and Vincent Lauriot-Prévost (VPLP), this new launch takes the torch from the Lagoon 620 as the company’s new flagship. The elegant interior is the work of Massimo Gino of Italian Nauta Design while the exterior styling is attributed to Patrick Le Quement. 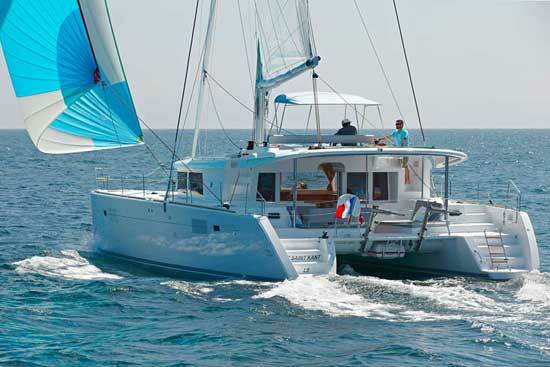 The new line is built by CNB, a division of Groupe Beneteau, and was unveiled at the Dusseldorf boat show earlier this year. The 120’ high carbon mast supports 3,609 sq. ft. of sail area, dominated by a square-top main, the foot of which is over 20’ above the waterline. With a choice of three headsails on hydraulic furlers, the triple-spreader rig is fairly manageable. 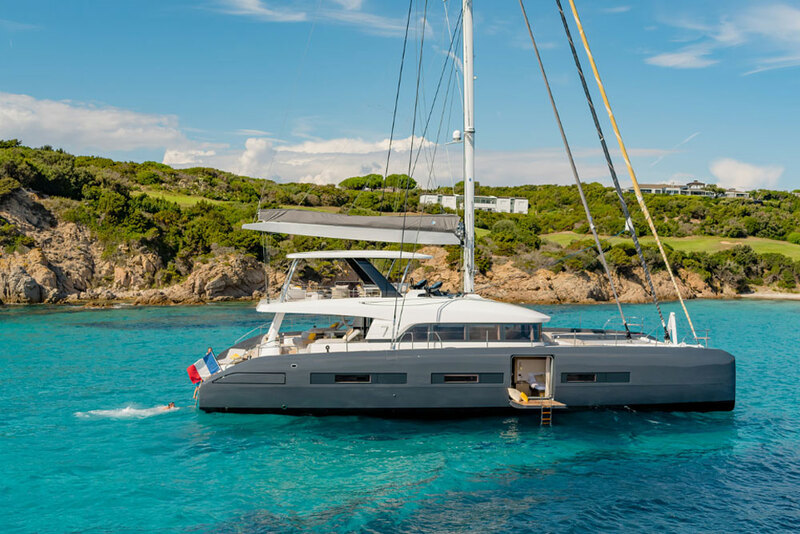 But Lagoon still expects that whether in private ownership or charter, this model will always have professional crew aboard. With a light displacement just under 126,000 lbs, the SEVENTY 7 carries 396 gallons of water and 740 gallons of fuel. Standard propulsion is provided by 180 HP diesels, although the first hull was upgraded with 230 HP John Deere engines with V-shafts. An approximate cruising speed is 9.2 knots under power and she’ll do up to 12 knots under sail on a beam reach in a 20-knot breeze. The SEVENTY 7’s on-deck dimensions are that of a tennis court. Although massive, she looks in proportion. 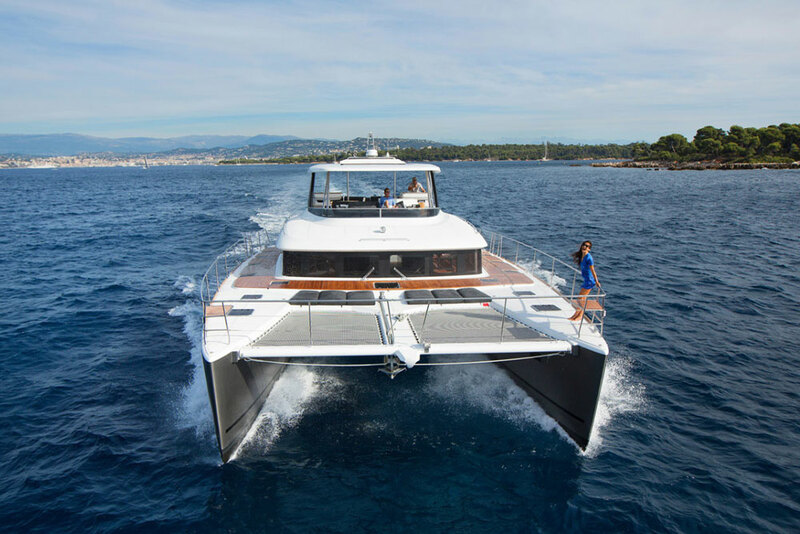 The transoms are separated by an optional hydraulic swim platform that lowers below the water to scoop up the tender, or to provide a nice teak beach to play on. Four wide steps lead up the transoms, both of which have boarding ladders. Seating for 20 is available in the 430 sq. ft. aft cockpit, mostly on various built-in lounge seats but also at an outdoor dinette to starboard. An elegantly-designed curved staircase sits in the port forward corner of the cockpit and leads up to the flybridge. The side decks are wide and dotted with flush-mounted hatches. There’s really nothing at all to inhibit easy movement from the transoms to the bows and as I walked forward, I noticed that the cabin-house roof was above my head. 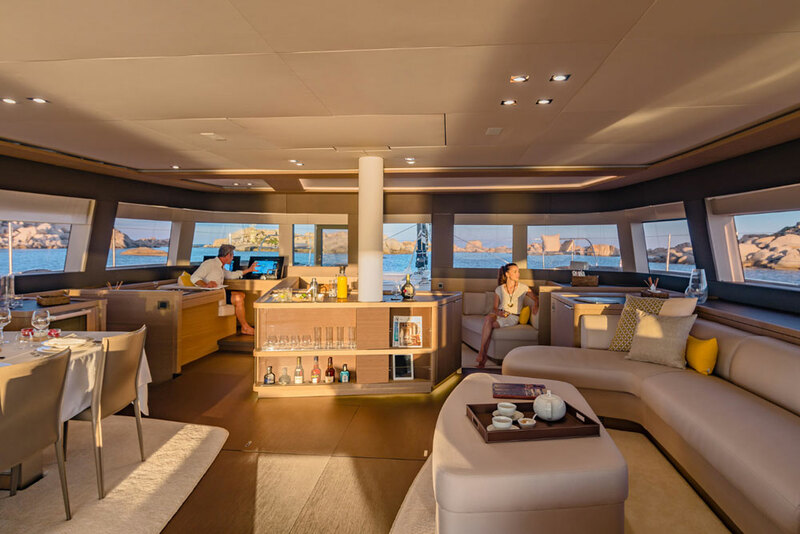 With its two L-shaped settees, the forward cockpit will be the shadiest place to enjoy cocktails at sunset when the boat is swinging on the hook with her bow pointed into the trade winds. Two steps up from the cockpit is the main deck, with an exposed vertical windlass flanked by lazarettes. The trampoline, bisected by the beam that holds the headsail furlers, is an ideal place to relax and catch some rays. The flybridge is the third outdoor social gathering space aboard. A fiberglass hardtop protects most of the aft lounge area that on hull number-one was outfitted with loose furniture. This is a trend borrowed from superyachts, where integrated seating has given way to furniture that’s not fixed and therefore may be reconfigured depending on the entertaining needs at the time. Owners can spec the flybridge in numerous ways from open space (with their own choice of the aforementioned furniture), an integrated sunpad that spans the entire aft beam of the bridge, or a starboard side settee and two sunpads separated by an optional hot tub. An outdoor galley module will help the crew prepare and serve meals here, without too many trips down to the full galley in the port hull. The outdoor spaces are so lavish you almost forget to step inside, but that, you must. A wide mirrored sliding-glass door opens electrically to reveal a cavernous interior main deck, which is on the same level as the cockpit. To port is a dining table with a banquette outboard and free-standing chairs inboard to accommodate eight for dinner. Opposite is a U-shaped settee that wraps around a coffee table. At the center and surrounding the mast is the central bar, perfect for serving cocktails. The inside helm station with twin B&G MFDs is in the forward port corner, with the whole deck surrounded by Lagoons’ signature vertical windows. The starboard forward corner is dedicated to what Lagoon calls the “owner’s private saloon”. It’s true that from here, there’s access to the master stateroom below and to the forward cockpit. But otherwise the area isn’t really separated from the main saloon, so the concept of privacy is a bit misleading. I’d call it more of an overflow saloon with extra seating for another six guests. On the first hull of the series, browns, greys and muted beiges combine to create an elegant and understated interior. 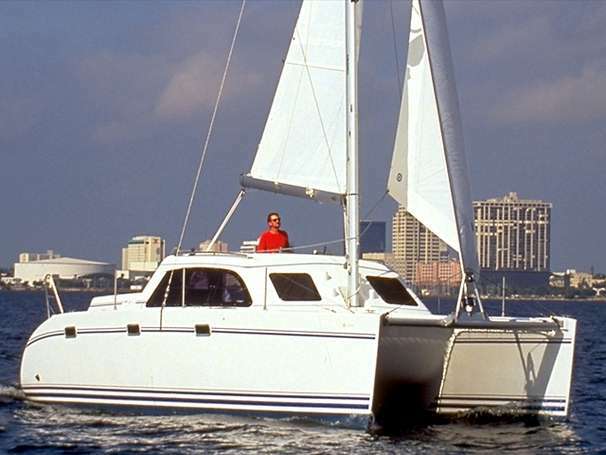 There are few handholds but one could argue that this cat will not be flying a hull or heeling under way, so perhaps that won’t be much of a problem. One thing that does warrant attention, however, is the texture of the cabin sole. The grey oak Wenge flooring on hull number one was extremely slippery and even with dry, bare feet at a steady dock, a few visitors skidded about. The lower deck offers significant personalization on this semi-custom design, with accommodations in three to five cabins plus crew quarters. The cabins in the port hull can even be reconfigured to add a massage room, a theater, a playroom, or a full conference room. With these options eschewed, the galley moves either forward or aft in the port hull. Either way it has direct access to the nicely-appointed crew quarters for two. Full-sized household appliances and a dinette share the galley’s 215 sq. ft. of space, which is larger than those found in some urban apartments. The master stateroom in the forward starboard hull is the cherry on the icing of the cake. Seven steps lead down to an opulent suite with a king sized bed, a full walk-in closet, a desk, a sofa and a large head with a double vanity for his and hers sinks. Altogether, 377 sq. ft. are dedicated to the comfort of the owner and this stateroom puts most posh hotel rooms to shame. But the piece de resistance is the personal veranda of over 30 sq. ft. which folds down from the master stateroom. This feature caused numerous people on the dock in Miami to pause, stare, and then scurry to get in line. It’s an optional feature that can be replaced by a longer sofa when you don’t spec it, but seriously, how would you not? A hydraulic door, hidden in the outer section of the hull, drops open to create an unbeatable view as well as a teak beach dedicated exclusively to the occupants of the stateroom. 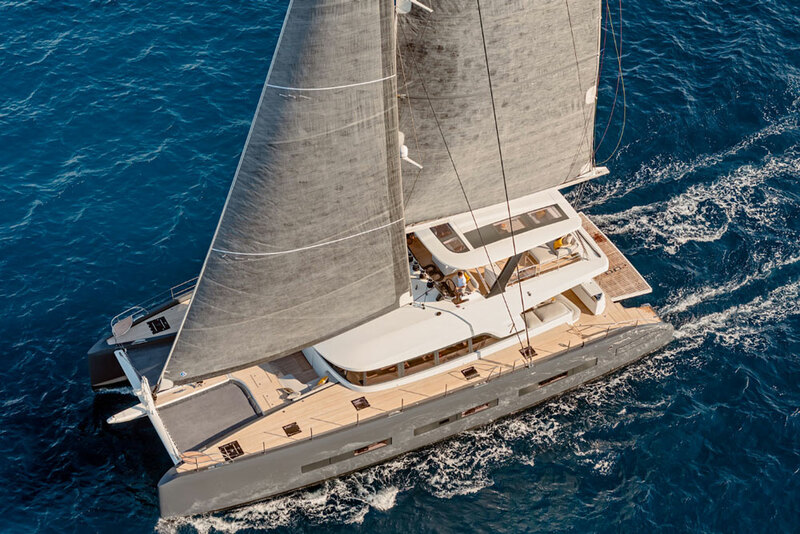 The SEVENTY 7 is 15’ longer than the previous Lagoon sailing flagship but that statistic is misleading. Not only is the new boat exponentially larger, it’s also on a whole new level. Measured by those standards, the $4.6 million price tag isn’t unexpected. 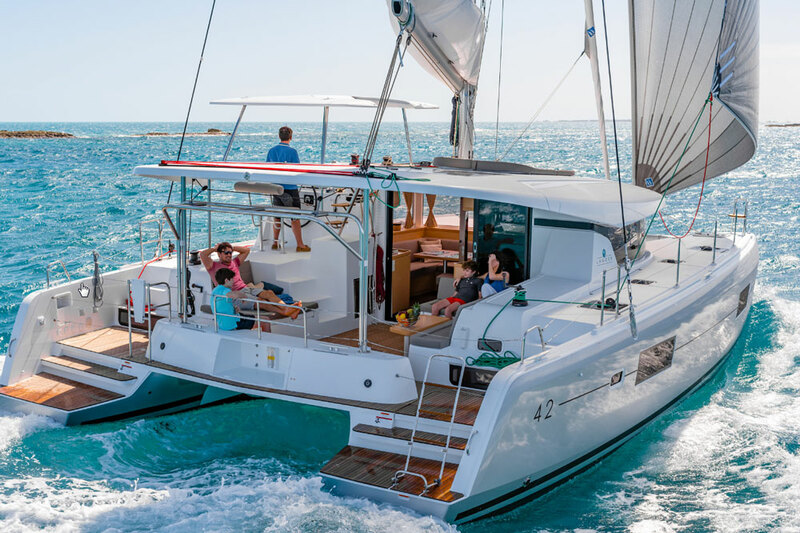 Other Choices: There aren’t many sailing catamarans in this size and class, but one that sails similar waters is the Sunreef 80 Carbon. See Lagoon SEVENTY 7 listings. Sail area 3,609 sq. ft.